This Brand Was Caught With a Toxic Ingredient and Immediately Changed! We all make mistakes right? That’s what I tell my kids. It’s what you do after the mistake that really counts. Well, here is a feel-good story about a brand that was faced with a toxic error in its formulation and made it right immediately. One of my favorite brands, Thrive Market, made a mistake in one of their “nontoxic” formulations and something snuck in that was toxic to the water supply and aquatic life. But when facing this problem, instead of running away or sending lawyers after Mamavation for discovering it, they decided instead to fix the problem and make it right. And we have decided to tell you this story because it’s a perfect example of what brands SHOULD do when they find they have made a mistake. We could all use a story that makes us feel optimistic about the world, right? You’ve trusted Mamavation to bring you topics like best organic mattresses & safest small kitchen appliances, now join us for a feel-good story about a brand that demonstrated their nontoxic values by reformulating immediately after discovery. Mamavation is Addicted to Bringing You Investigations. No Really, We Aren’t Kidding. This is How We Spotted Thrive Market’s Mistake. Mamavation is serious about bringing you the safest products available for your family. This is why we focus so much on product investigations that pick apart ingredients and trends. And really this is because I spent so much time frustrated as I was scrutinizing brands for my family that I decided to pay it forward and share it with you. I figured you may have felt the same way. So here are most of the investigations we’ve done over the past five years in case you want to venture further. Earlier this year, Mamavation did an investigation on laundry detergent and we included most of the most popular and also all the non-toxic brands. At first, I forgot to look at Thrive Market and their laundry detergent and we completely left them out. Ooops! Very soon community members starting asking us where Thrive Market’s laundry detergent would fit in our rankings and we took a look and were shocked at the ingredients. Thrive Market had phosphates in their laundry detergent. Phosphates are incredibly problematic to our water supply and aquatic life polluting rivers, streams, and lakes. How is it possible that an ingredient like this found it’s way into Thrive Market’s laundry detergent? And how did I never notice this before? Faced with this, we immediately added them to the “bad” category…even though we’ve had an affiliate relationship with Thrive Market since 2014. Later after the investigation started getting traction, I received an email from a worker at Thrive Market titled “libelous content on your blog” which make me click immediately. It turns out I was being emailed by the person who is in charge of evaluating their generic brands for ingredients to ensure they are non-toxic. This was her product and she was a little miffed, to say the least. So I replied back to her immediately and cced their Co-Founder Gunnar Lovelace who I’ve known since 2012 when he first co-founded Thrive Market. I explained to them that phosphates were a hard trigger and any brand that had that ingredient was automatically put in the “bad” category for pollution. And this is important because the water supply in the United States is in peril from all sorts of contaminants like PFAS, PCBs, lead, birth control, other pharmaceutical medications, etc. Gunnar emailed me back saying that he would look into this immediately and would get back to me soon with more thoughts. So I waited a few more days and got an email from the same person that sent me the original email. She apologized and informed me that this ingredient was a mistake. Score! Thrive Market is reformulating! The rest of the email was more questions about my ranking system and we went back and forth with what ingredients to avoid. And then Gunnar Lovelace, the Co-Founder, chimed in again saying “Thanks guys! Good to see us getting better together. ” And that’s really what happened…we got better together. People make mistakes, but it’s what you do afterward that says who you are. Thrive Market is one of the good guys and they proved it quickly that week. So Thrive Market will be reformulating their laundry detergent to exclude phosphates. That’s one less brand polluting our water supply and killing aquatic life. And it makes total sense to me because of what I know about the people who founded this company. They didn’t get into this business to get rich. They got into this business to deliver nontoxic products & organic food to people who couldn’t afford it. That’s what sold me originally on Thrive Market before they opened the doors. And with all the popularity they’ve seen, they are STILL holding true to that original mission. Good for them! I’ve been doing these investigations for years and this is the first time a brand decided to reformulate their product IMMEDIATELY after hearing from us. (Okay, maybe it was a few days but that’s still very soon.) Most of the time, I’m met with denial, an argument about our standards, and threats. And it just spirals after that to more nastiness. No one likes to be told that their product is toxic. This was a moment where a brand really listened to what we were saying, apologized for initially overreacting, and then immediately took action. I’m totally good with that! In fact, I’m proud of them in a similar way that I’m proud of my kids when they fail and get back up. That’s called grit and it’s even more commendable when it’s also paired with humility and justice for all. Would You Like to Give Kudos to Thrive Market? You Can Today! Kudos to Thrive Market. If you would like to give them a high five you can do that. 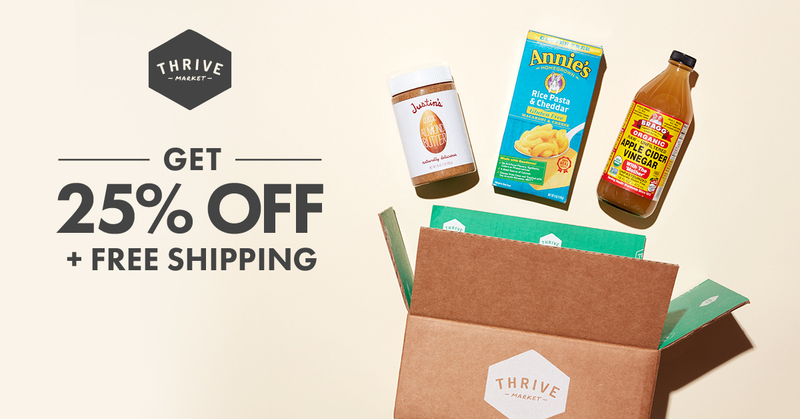 You can join Thrive Market and save between 25% to 50% on all the non-toxic & organic products you buy. (Except for the laundry detergent, that’s not available yet.) Click here to get an additional 25% off your first order and free shipping. Joining Thrive Market means you not only will you save money, but you’ll also be supporting a brand that is working hard for all of us. Sure, they made a mistake, but haven’t we all? I’m more impressed with how quickly they handled it.